Dyspnea is frequently experienced in advanced cancer patients and is associated with poor prognosis and functional decline. 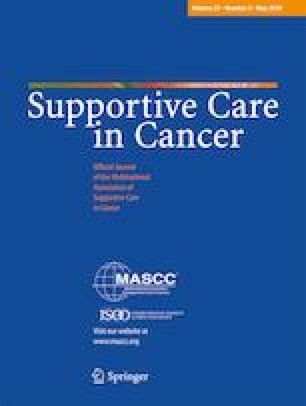 This study used the Edmonton Symptom Assessment System (ESAS) to characterize the relationship between dyspnea and concurrent symptoms experienced by advanced cancer patients. A prospective database was collected and analyzed to extract patient demographics and ESAS scores. Logistic regression analysis and generalized estimating equations (GEE) identified correlations of other ESAS symptoms in three categories: severity of dyspnea (none, mild, moderate, severe), moderate/severe dyspnea (ESAS ≥ 4), and presence of dyspnea (ESAS ≥ 1), at patients’ first visit and over time, respectively. Multivariable analysis revealed drowsiness (p = 0.001), and anxiety (p = 0.01) and appetite loss (p = 0.02) were associated with increased severity of dyspnea at first visit. Over time, tiredness (p = 0.02), drowsiness (p = 0.04), nausea (p = 0.02), and anxiety (p = 0.0006) were more likely to experience increased dyspnea severity. Tiredness (p = 0.0003), depression (p = 0.03), and appetite loss (p = 0.003) were significant for moderate/severe dyspnea at first visit. Over multiple visits, tiredness (p < 0.0001), anxiety (p = 0.0008), and appetite loss (p = 0.0008) had higher probabilities of moderate/severe dyspnea. For the presence of dyspnea at the first visit, anxiety (p = 0.03) and drowsiness (p = 0.002) were significantly correlated with an increased frequency of dyspnea. Over time, anxiety (p < 0.0001) and drowsiness (p < 0.0001) remained significant with the addition of nausea (p = 0.0007). The highly interactive relationship between dyspnea and other common cancer symptoms necessitates the development of comprehensive symptom assessments and utilization of multimodal management approaches that consider concurrent symptoms for improved identification and treatment of dyspnea. We thank the generous support of Bratty Family Fund, Michael and Karyn Goldstein Cancer Research Fund, Joey and Mary Furfari Cancer Research Fund, Pulenzas Cancer Research Fund, Joseph and Silvana Melara Cancer Research Fund, and Ofelia Cancer Research Fund. We thank the support of Medigas. The present study was approved by our institution’s Research Ethics Board.